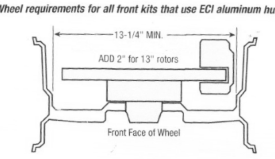 ECI introduced the first Mustang II/Pinto "BIG BRAKE" conversion kit in 1981 and we still offer the largest selection and the best value in the industry. Our 11" diameter rotor kits use the early GM "BIG" piston calipers and provide 65% more braking capacity than the stock Mustang II, and more than twice as much as other so called "Big Brake Kits" using the later smaller piston GM calipers. Our selection of Mustang II/Pinto conversion kits are available with 4-1/2" Ford and 4-3/4" GM bolt circles and as Basic Kits or Complete Kits. MOVES EACH WHEEL OUT APPROX. 5/16"
We've done it! 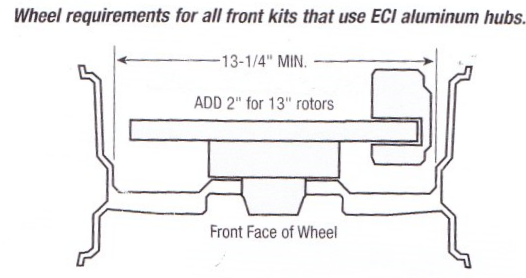 ECI has developed a Mustang II/ Pinto BIG BRAKE KIT that's perfect for your street rod. By combining components from existing kits, we can now offer 11" diameter rotors, BIG GM calipers and our aluminum hubs. This kit provides 65% more braking with no wheel offset! 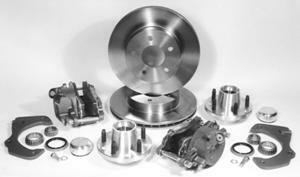 No other "Big Brake Kit" can offer this at any price!